Bürkert will present its new stainless steel 2/2-way angle seat valve that can deliver mixing, distributing and multi-way functions with a compact dimensions. 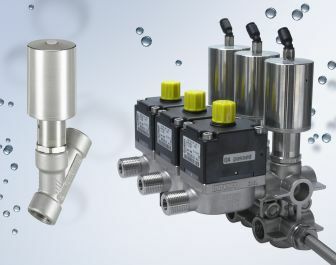 The new pneumatically operated 2000 INOX angle seat valve from Bürkert consists of a pneumatic piston actuator and a two-way valve body. Both parts are manufactured from stainless steel 316L and can be used with media at temperatures of up to +180～C. In addition to high temperature resistance, the material offers protection against corrosion and is suitable for applications with high requirements for hygiene. The 2/2-way valve can be used for the control of numerous media, such as water, alcohols, oils, steam and air. Fuels, hydraulic fluid, saline solutions, alkaline solutions, organic solvents and neutral gases can also be isolated with the valve. The compact actuator can be selected as either normally open or normally closed in its resting position. The flow-optimized valve body with flow below seat enables high flow rates and the self-adjusting packing gland provides for an optimum seal, explains Bürkert. For compact design and flexibility for adaptation to customized applications, Bürkert offers a modular block system based on the 2000 INOX valve, which can be used to implement complex solutions within minimal space. The multi-functional block replaces the connecting tube solutions used in the past. The new system significantly reduces assembly time and connecting elements such as elbows and T-adapters are eliminated entirely. Through the elimination of potential leaks paths and the reduction of material and minimization of space, the use of multi-functional blocks significantly improves the overall system performance, according to the company. The blocks can be used for the effective and space-saving implementation of essential fluid functions, such as distributing, collecting and mixing systems, whilst offering the integration of sensors, filters and non-return valves.